Uncertainty is mixed with hope for members of Iraq's tiny Mandaean minority as Iraq finishes ith third day of elections today. On the one hand, there is a seat set aside for a Mandaean representative in the next Iraqi parliament. The Mandaeans, who are an ancient monotheistic religion with its own scriptures and a distinctive ban on circumcision are also pacifists, which has made them an inviting target in a country riddled with violence. They practice weekly baptisms in rivers where they reside. Although John the Baptist is one of their prophets and Sunday is their day of weekly prayer, they are not Christians. Marring the positive step of a Mandaean seat in parliament is the fact that only those Mandaeans residing in the Baghdad district may vote for the Mandaean representative. The Mandaeans have no district in the country that is their distinctive place of residence. As always, they have been scattered across the country. The restrictive voting requirements for choosing a Mandaean representative effectively disenfranchise Mandaean citizens in other districts. It is possible for Mandaeans to be included on other party lists in the elections. Whether this is a "divide and conquer" tactic or a chance to give the Mandaeans a greater voice remains to be seen. In the Iraq after Sadaam Hussein, the position of ethnic and religious minorities has become dangerous. Warring militias have murdered Christians, Yazidis and Mandaeans as well as other religious groups who have a long history in Iraq. In past Islamic history, there was protection afforded to "people of the book". Christians, Jews as well as Samaritans fell into that category. Mandaeans were once likewise protected. Unfortunately, some so called "Muslim fundamentalists" stripped away that protection. Part of the campaign for Mandaean civil rights should be to restore this protected status which though far short of western ideas of civic equality, protects those who exist under it from being killed or harassed. Those who profess to be Muslim must be restrained by Muslim religious authorities from tormenting Iraq's minorities. 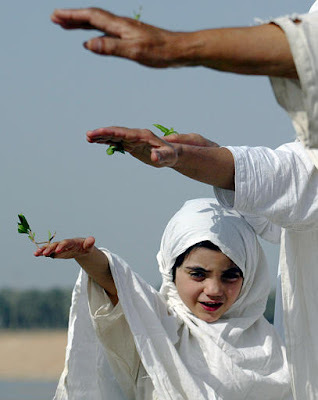 The Mandaeans have lived quietly in Iraq as well as Iran, occupying a niche in the educated professional class as doctors and jewelers as well as other university educated professionals. They practice charity to all, regardless of whether they are coreligionists or not. They do not seek or accept converts. In no way can they be seen as seeking to entice others from their faith. Their roots in Iraq go back at least as far as the second century and quite possibly earlier. In exile from their home in Iraq and Iran under trying circumstances, they fear losing touch with their traditions. The present political landscape in Iraq is a byproduct of the US sponsored overthrow of Saddam Hussein. It is our moral duty to seek the welfare of those who were most grievously wronged in the post Saddam Hussein era. The Mandaeans fall into this category. Americans should express their concern for Mandaeans in exile, as well as those who cling in fear to their ancient homeland.